To coincide with the 200th anniversary of the events of May 1808 and the start of the Spanish War of Independence, the Museo del Prado is presenting a major exhibition this spring devoted to Goya. 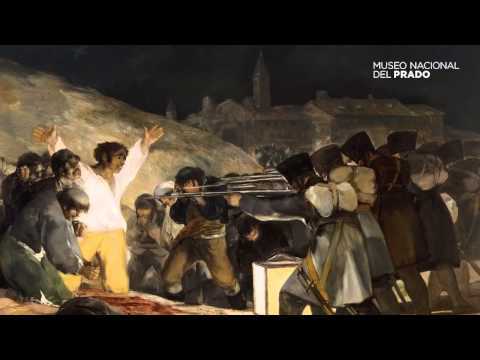 It focuses on the two great canvases of the 2nd and 3rd of May 1808 in Madrid which are currently being cleaned and restored, while also analysing and presenting Goya in a broader context. 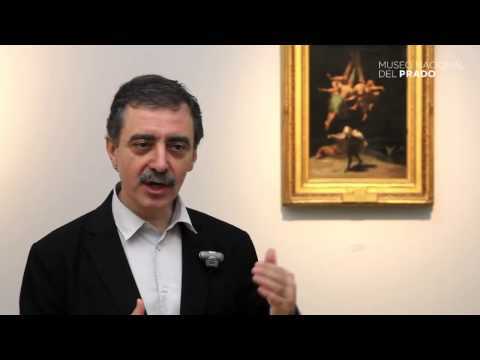 The exhibition, which features almost 200 works by the artist, has been jointly organised by the Museo del Prado and the SECC*, with the support of the Region of Madrid. It falls within the framework of the commemorative programme sponsored by the National Committee for the Bicentenary of the Spanish War of Independence. With the present exhibition, the Museo del Prado is commemorating the bicentenary of the start of the Spanish War of Independence. It will offer the visiting public the chance to see a group of almost 200 works by Goya. 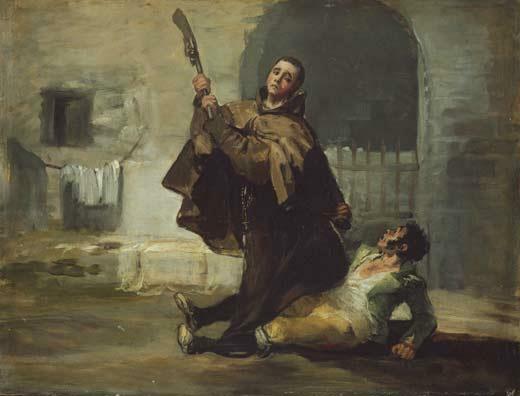 In addition to works on paper, they include more than 65 paintings loaned from other institutions and private collections, including Majas on the Balcony and Portrait of the Marchioness of Montehermoso, both from private collections; Friar Pedro de Zaldivia clubs Maragato the Bandit from The Art Institute of Chicago; The Capture of Christ from Toledo Cathedral, and a group of nine works loaned by the Real Academia de Bellas Artes de San Fernando, Madrid. The latter are essential to the theme of the exhibition and will be presented for the first time within the context of Goya's artistic development. Both the number of works on display and their outstanding quality make this the most important international exhibition on Goya since the one also organised by the Prado in 1996. Witches' Flight. Francisco de Goya. 1797 - 1798. Oil on canvas. 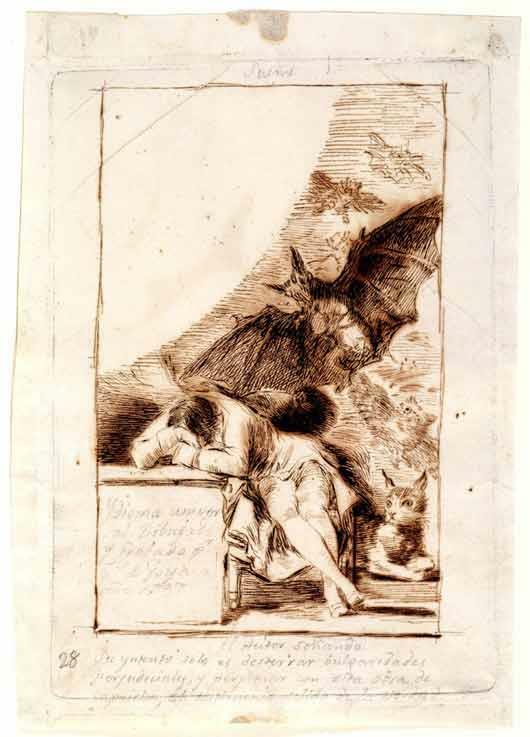 Between 1792 and 1793 Goya had a serious, although as yet unidentified illness that left him deaf. He returned Madrid after a period of convalescence in Cadiz and his art assumed a new and independent direction through his early albums of drawings, a phase that would culminate in 1799 with the publication of the Caprichos. 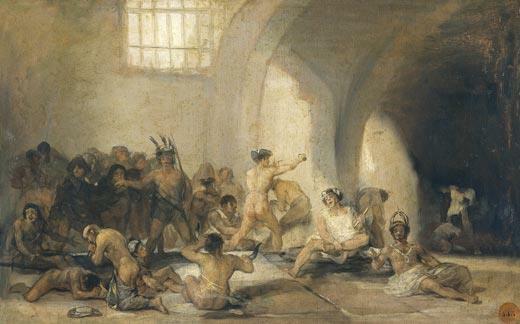 Painting for himself rather than on commission and expressing his own ideas, Goya produced small-format paintings in which he depicted increasingly dramatic scenes of violence and neglect, such as Prisoners in a Cave, Yard with Lunatics and various scenes of cannibals, all cruel metaphors of man and civilization. 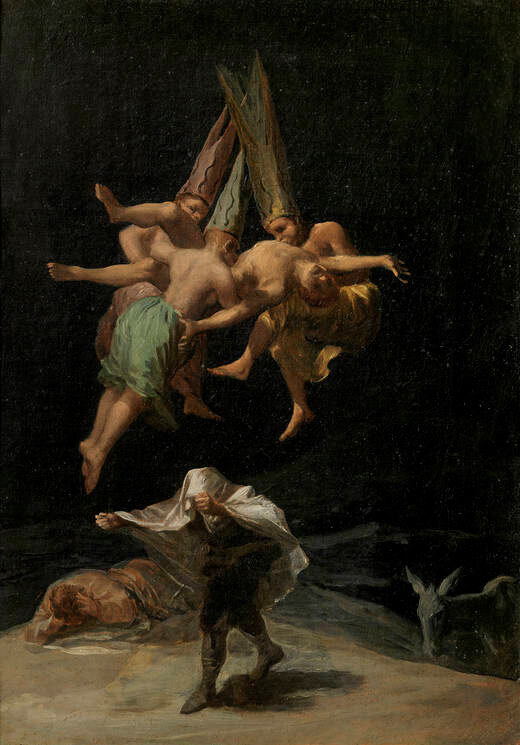 Dating from the final years of this decade are the “scenes of witches” in which - in a manner comparable to the Caprichos - Goya used these figures from popular culture to express different meanings, from evil and ignorance to more elevated ideas. Around 1795, when Spain declared war on revolutionary France in the War of Rosellón following the execution of Louis XVI, Goya resumed his intense activity of the previous years, receiving commissions for portraits of aristocrats and politicians. He continued to paint for his patrons the Duke and Duchess of Osuna and for Jovellanos, while new clients included the Duke and Duchess of Alba and Godoy. For the latter he painted The naked Maja, a modern title that distorts the original perception of the work as a Venus. The Church continued to be a crucial patron, and during these years Goya executed important works such as those for the Oratorio de la Santa Cueva in Cadiz, the frescoes for the church of San Antonio de la Florida in Madrid, and The Taking of Christ for Toledo Cathedral (on display here). He also started to produce modern and informal portraits of his friends, such as those of Martín Zapater and Céan Bermúdez. This phase in Goya’s career culminated with his appointment as Court Painter in October 1799, the highest rank within the career of official painter. On 6 February 1799 the Diario de Madrid published an advertisement for the Caprichos, a visual satire on men’s vices and the absurdity of human conduct. Over the previous years Goya had focused intensely on drawing, representing images of daily life and devising imaginary compositions through which he presented satires of modern life. The result of this activity was the Sanlúcar Album and the Madrid Album, which contain the seeds of some of the ideas expressed in the Caprichos. The series focuses on four principal themes: deceit in relationships between men and women; satirical comment on poor education and ignorance; a condemnation of society’s traditional vices; and a protest against the abuses of power. With the new century, Europe witnessed the rise of Napoleon who would become Consul and Emperor in the space of a few years. In 1800 Goya painted The Family of Charles IV, a brilliant allegory of Bourbon power, although also a reflection of the Ancien Régime in contrast to the modern nature of power in France, now an ally of Spain who thus found itself in conflict with England. Guillemardet, the Consulate’s active and proud new ambassador in Spain, offered a contrast to the negligent Godoy, “victor” of the farcical War of the Oranges. Rising to the challenge of devising a new type of portrait of the proud and haughty landowning aristocracy and the rising and prosperous middle class with its entrepreneurial and pragmatic attitudes, Goya revealed a remarkable capacity to capture the nature of his sitters. Presenting each of his sitters differently and individually, he invested them with an admirable psychological realism, reflecting external appearance as well as the sitter’s unique, personal universe. 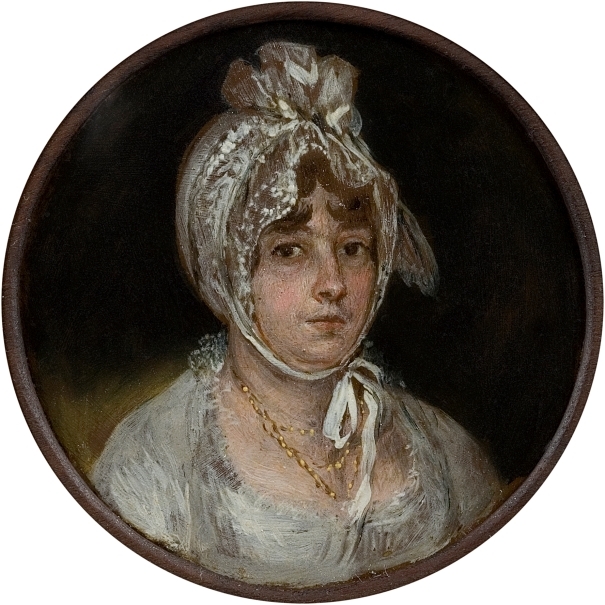 Following the fashion of the day, Goya depicted cultured aristocratic women as Muses, either painting, such as the Marchioness of Villafranca, or with their musical instruments, such as the Marchioness of Santa Cruz. He also painted ambassadors, ministers, such as Antonio Noriega, and intellectuals of the day, such as the director of the Academia de Historia, José Vargas Ponce. The portrait of The Countess of Chinchón, elevated to the rank of princess through her marriage to Godoy and victim of the monarchs’ interests, is displayed here next to the image of her husband (with which it may have once formed a pair) for the first time in more than 200 years. In these works Goya’s brushstroke perfectly conveys different materials, textiles, flowers, weapons and pieces of furniture, while the draughtsmanship is secure, the colouring brilliant and the technique restrained. The artist spent these fruitful years up to the Revolt of Aranjuez and the French invasion satisfying the demands of patrons eager for his portraits, a situation that resulted in a decrease in his creative independence, although the masterly series on the bandit Maragato also dates from this period. 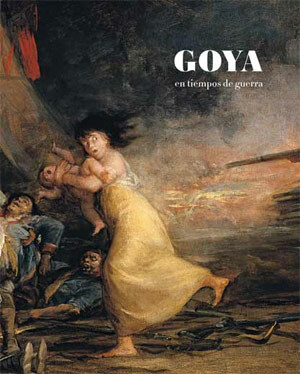 Goya was in Madrid on 2 May 1808, the day of the uprising against the French. In late October he went to Zaragoza on the invitation of Palafox to paint the heroism of the first siege of that city. Under the regime of José I Bonaparte, who awarded him the Royal Order of Spain, and with friends in important positions, Goya continued to work as Court Painter, executing portraits of some of the key figures in the pro-French government and the Napoleonic army, such as General Guye. His drawings of these years depict the modernising measures implemented by the French, but he also produced the series of prints entitled Fatal Consequences of the bloody War of Spain against Bonaparte as well as other similar paintings that convey his pessimistic view of the violence and dehumanisation brought about by the war. The melancholy series of Still Lifes dates from this period, as do other more personal paintings, such as Majas on the Balcony. Goya used an obsessively realist technique in his official portraits and a different, more direct and rapid manner in his more informal portraits such as those of his wife’s parents and of his beloved grandson, Mariano. Commissioned during the Regency, recently rediscovered documents prove that Goya painted these compositions after Fernando VII’s entry into Madrid, between June and October 1814. 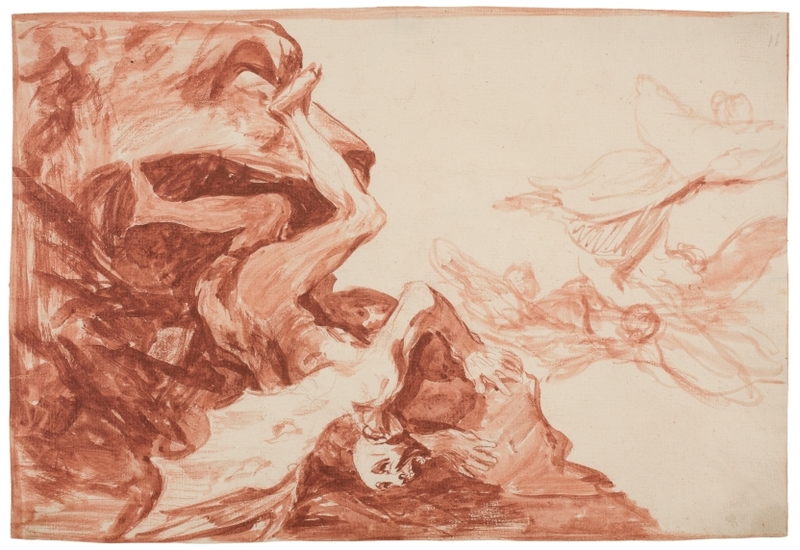 In contrast to patriotic commemorations of the victims of 2 May in Madrid, here, as in The Disasters of War (which provided their starting-point), Goya emphasised the madness and irrationality of violence that leads human beings to fight to the death. The paintings were conceived as a pair, one a daytime and the other a night-time scene, in which parallel groups and figures emphasise the idea that the violence committed by the Spanish people against the French troops provoked the equally cruel violence of the French against their attachers. Rather than epic heroism, Goya reflects inhuman cruelty and terror in the face of death, which the characters confront with anguish, despair and repentance. Only the horses in the first scene look out towards the viewer, communicating the sense of human madness through their intelligent and rational gazes. 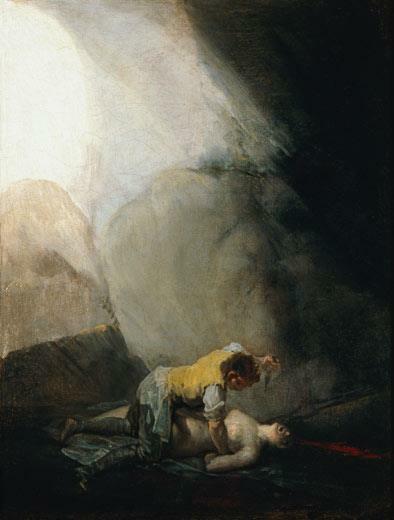 Goya’s varied technique and superb use of light function to create the expressivity and realism of these two scenes, qualities that appear together only much later in nineteenth-century painting. In May 1815, Goya was found not guilty by the regime of Ferdinand VII of collaboration with the French, despite having worked for José I. He painted the portraits of Ferdinand and his followers, and a final work for the royal palace, Saint Elizabeth of Portugal curing a sick Woman. During these years Goya executed several important commissions such as the painting of the Junta de Filipinas (Castres, Musée Goya), as well as various altarpieces: Saints Justa and Rufina for Seville, and The Last Communion of Saint Joseph of Calasanz, his last public work. He also produced a series of small-format paintings, now in the Academia de San Fernando, and a number of portraits. Some are austere works in which black is the prevailing tone while others are of a luminous, pre-Romantic nature, all marked by his outstanding ability to convey the psychology of the sitter. 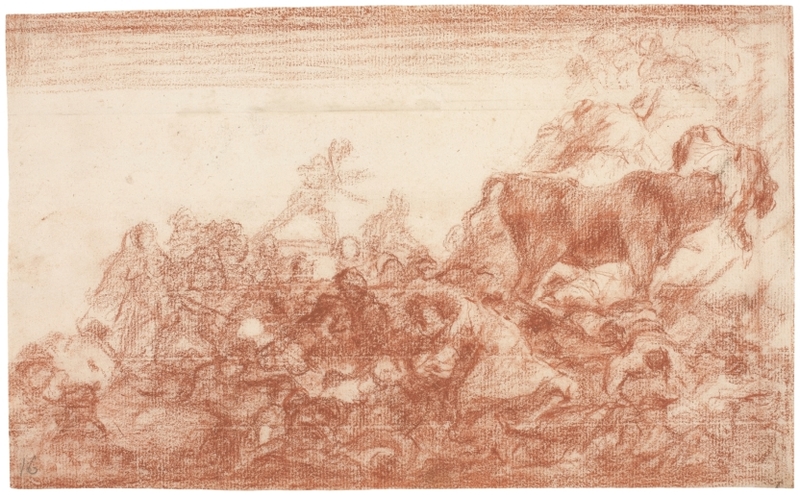 Goya increasingly focused on his albums of drawings through which he denounced Ferdinand’s repression of the liberals, and on two series of prints, the Tauromaquia and the Disparates [Follies], while also experimenting with the new technique of lithography. In 1819 he again fell gravely ill but recovered and embarked on a new period of freedom and modernity in the works executed during his exile in Bordeaux. 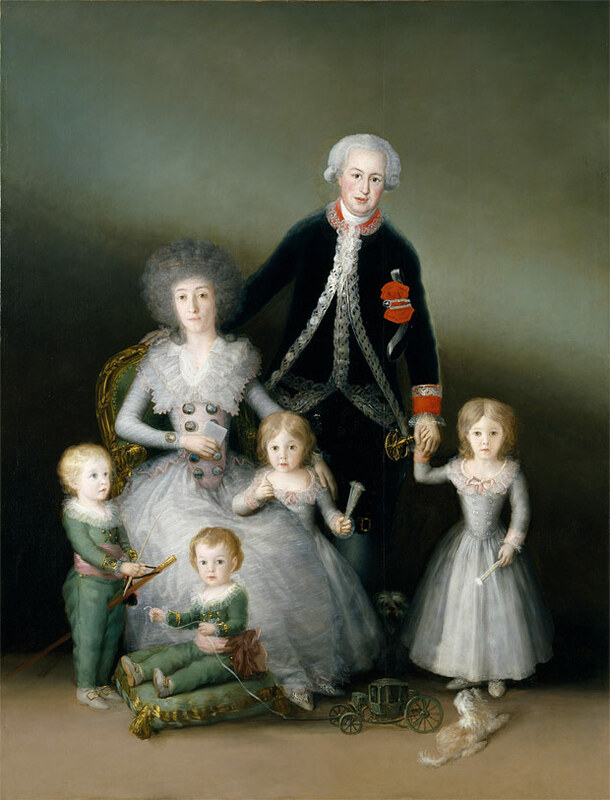 The Duke and Duchess of Osuna and their Children. Francisco de Goya. 1787. Oil on canvas. The latter half of the second decade of the century, between 1815 and Goya’s serious illness in late 1819, was marked by a period of enormous creative activity. Goya’s artistic and public life in Spain culminated with the large altarpiece The Last Communion of Saint Joseph of Calasanz. It concluded the cycle begun almost fifty years earlier in 1773 when the artist painted the Small Choir of the basilica of El Pilar, his first religious work. As on previous occasions, the contrast between light and shade becomes a metaphor for the confrontation between wisdom and ignorance, and between the saint’s goodness and intelligence, as he is received by the divine light, and the surrounding shadows of those who accuse him of heresy. Similarly, Goya used this alternation of light and shadow in his portrait of his friend the architect and Freemason Tiburcio Pérez Cuervo (1820). Saints Justa and Rufina painted for Seville Cathedral has a monumental, classicising beauty of great serenity. 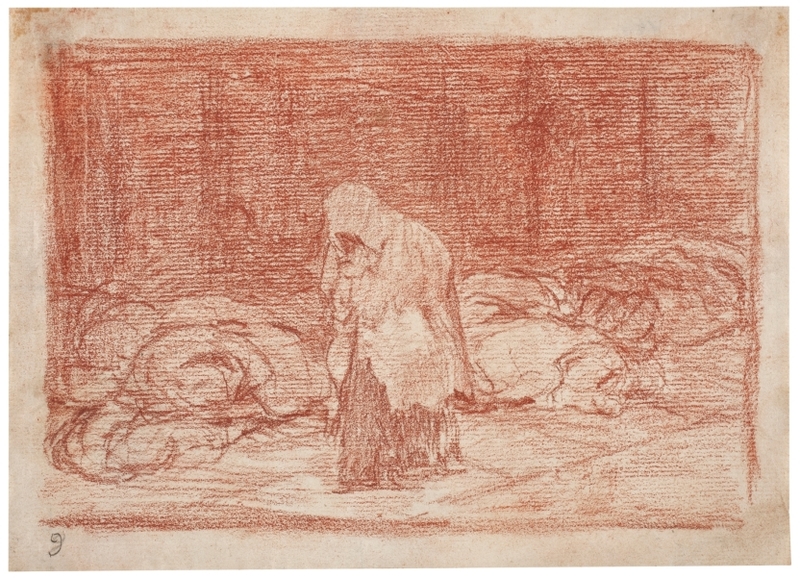 This type of beauty is also evident in the contemporary drawings in The Black Border Album E, in the beautiful image of Philosophy and in The Sufferings of War, in which the figure of a crippled beggar offers a fierce moral and political critique of the misery suffered by those who had sacrificed all for their country. Once again, the portraits of this period reflect Goya’s ability to capture his sitters’ personalities. In 1817 he painted two members of the Osuna family, who were loyal patrons of the artist throughout his life. 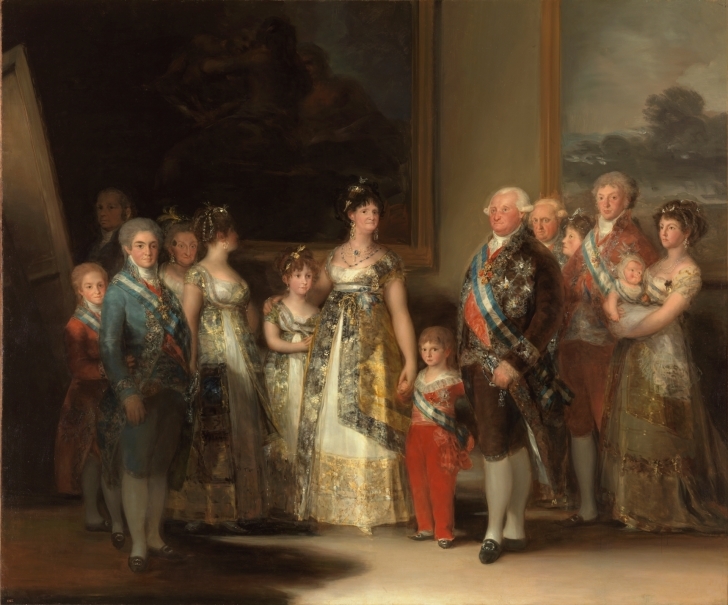 As with religious his paintings, these were the last portraits that Goya produced of the aristocracy, a labour he had begun forty years earlier with The Family of the Duke and Duchess of Osuna of 1787 (Madrid, Museo del Prado). Now, The Duchess of Abrantes and her brother, The 10th Duke of Osuna, close this cycle with the same luminous beauty and sense of aristocratic dignity to be found in earlier works. Didn’t you know what you were carrying on your back? José Luis Díez, Chief Curator of 19th-century Painting at the Prado; Juan J. Luna, Head of the Department of 18th-century Painting and Goya; José Manuel Matilla, Head of the Department of Prints and Drawings; Gudrun Maurer, art historian and associate of the Museo del Prado; and Manuela Mena, Chief Curator of 18th-century Painting and Goya and curator of the exhibition.